Will fuel cell vehicles be able to thrive and surpass plug-in vehicle sales? The question of which clean technology will prevail in the car of the future continues to permeate the auto industry. Plug-in electrified vehicle sales led the way in recent months, breaking the 1% mark of total sales in the U.S. for the first time in November; and seeing ambitious PEV product launch announcements from Volkswagen, Daimler, BMW, and Toyota in the fall. That was triggered by Tesla receiving more than 400,000 down payments soon after showing its Model 3 reveal during the spring; and post-VW “dieselgate” scandal government crackdowns increased in Europe, the U.S., and South Korea. Hydrogen fuel cell vehicles are starting to see new vehicle launches and more stations being built, but it still has a very slight presence in the global market. But long-term, global auto executives think fuel cell vehicles will win out over PEVs in volume sales. One of the issues involved is that California’s zero emission vehicles mandate counts battery electric vehicles and fuel cell vehicles, but is phasing out plug-in hybrids; and nine other states are also following California’s ZEV guidelines. KPMG’s Global Automotive Executive Survey 2017 interviewed almost 1,000 senior executives from auto industry companies, including automakers, suppliers, dealers, financial services providers, rental companies, mobility services providers, and companies from the information and communication technology (ICT) sector. Additionally, more than 2,400 consumers from around the world were surveyed to share their perspectives and have them compared against the opinions of leading auto executives. Battery electric mobility shot up from No. 9 in 2015 to No. 1 in 2017. KPMG consulting analysts see the success of BEVs depending on infrastructure and application. “Success of BEVs depends on infrastructure and application. Coordinated actions for infrastructure set-up, and a clear distinction of reasonable application areas (e.g. urban, long-distance) needs to be established,” said Moritz Pawelke, global executive for automotive at KPMG. The report sees a few market trends clashing together, lost in translation, between evolutionary, revolutionary, and disruptive key trends that all need to be managed at the same times. Industry executive are “torn in between” as traditional combustion engines have become even more technologically relevant, but socially unacceptable. It’s also a new phase in the industry history where connectivity, mobility services, and automated vehicles are approaching faster than expected. Executives are tipping toward fuel cell vehicles may be that they have a strong attachment to the existing infrastructure and traditional vehicle applications. That comes from fast fueling and liquid gas pumps at fueling stations, and an existing fueling infrastructure carrying hydrogen in pipelines and tanker trucks. Setting up a user-friendly charging infrastructure is the problem leading 62% of the surveyed auto industry executives to believe that BEVs will fail. “The faith in FCEVs can be explained by the hope that FCEVs will solve the recharging and infrastructure issue BEVs face today. The refueling process can be done quickly at a traditional gas station, making recharging times of 25-45 minutes for BEVs seem unreasonable. However, this technology is far from market maturity and will bring new unsolved challenges like the cooling of hydrogen or the safe storage in a car,” the study said. Less experience with the technology by consumers and fleet operators. There’s concern over safety, reliability, cost, and refueling infrastructure outside of California. Sales volume has been soft and will take years to grow. For example, HybridCars’ Dashboard reports that there were 1,034 Toyota Mirais, the top-selling fuel cell vehicle by far, in the U.S. during 2016. That compares with 29,156 Tesla Model S units and 24,739 of Chevy Volt units, the two top selling plug-in models in the U.S. last year. Europe is beating the U.S. in hydrogen stations, but the sales are still behind the limited numbers seen so far in the U.S. The European Alternative Fuels Observatory reported in December that there are over 75 hydrogen fueling stations in operation in Europe, more than double the U.S. with its current level being 33 as of early December, according to U.S. Department of Energy’s Alternative Fuels Data Center. EAFO also reported that there are about 500 passenger fuel cell electric vehicles on European roads, with only about 200 of these units sold during 2016. Fast chargers are breaking through in the U.S., and will see more activity in Europe and Asia. That’s being led by Tesla’s Supercharger network and the EVgo and ChargePoint networks in the U.S.; and German automakers in Europe. Hydrogen stations are being established as singular, hydrogen-only stations and not as part of existing retail gas stations. The KPMG study indicates that those surveyed and writing the report assume that hydrogen pumps will be added to gas stations, but that hasn’t been the case so far. Hydrogen stations cost about $1 to $2 million per station to build, and need to have their hydrogen supply trucked in or coming through a hydrogen pipeline. While the Shell hydrogen station in Torrance, Calif., sponsored by Honda and Toyota, has fuel coming in from a pipeline, the other stations usually have the fuel delivered by tanker trucks like the ones used at gas stations. Government backing is helping a lot of these hydrogen stations to be developed in California, Europe, and Japan, but long-term, the fueling question will need to be resolved. That would likely include the home hydrogen station concept being explored by Honda. Automakers are still resisting spending enough on marketing PEVs to help get car buyers to take them more seriously. The Northeast States for Coordinated Air Use Management, a nonprofit group made up of air-quality regulators from eight states, just issued a report on this topic. Car companies are targeting them at a few select state like California and not going national like they are with gasoline-powered vehicles. Automakers are spending their finite ad budgets on vehicles known to sell well and generate profits, like pickups, SUVs, and luxury cars. PEVs haven’t become profitable for them yet. Hybrids aren’t going away even if ZEV regulations are heading in that direction. Over the next 5 years, 53% of automotive executives in the KPMG study are planning to highly invest in plug-in hybrids and 52% in ICEs and full hybrids. Hybrids make up nearly 3% of new vehicle sales compared to plug-ins, and plug-in hybrids are doing very well including the Chevy Volt in the U.S. and the Mitsubishi Outlander PHEV in Europe. Carsharing, ride-hailing, and ridesharing aren’t just a momentary fad. According to the KPMG study, by 2025, more than half of all car owners today will no longer want to own a car. That comes from 59% of auto execs and 35% of consumers surveyed. Auto execs think that disruption will led to more support for mobility as a service, and shared vehicles and trips. I would agree with other analysts who also believe vehicle electrification will play a big part in the shared economy. Young consumers tend to be more interested in electric vehicles and supportive of the technology, especially if it’s powered by renewable energy. They’re more likely to use Uber, Lyft, Zipcar, and other mobility services and have been losing interest in owning cars. China is the leading auto market in the world, and sales of “new energy vehicles” are expected to grow. India will soon be the largest nation in the world, surpassing China’s population in the near future based on current birth rates. About two thirds of the auto executives interviewed think that the global share of new vehicle sales will reach 40% sold in China by 2030. Two-thirds of those interviewed think that India won’t come anywhere near China in new vehicle sales in 2030. PEV sales in India have been slight compared to China, Japan, South Korea, the U.S., and Europe. Green truck nominees: Green Car Journal and the San Antonio Auto & Truck Show named 10 finalists for the 2017 Green Truck of the Year and Commercial Green Car of the Year awards, which will be presented in San Antonio on November 10. Finalists for 2017 Green Truck of the Year include the Chevrolet Colorado, Ford F-250 Super Duty, GMC Canyon, Honda Ridgeline, and RAM 1500. Vying for 2017 Commercial Green Car of the Year are the Ford F-250 Super Duty, Ford Transit Connect, Mercedes-Benz Metris, Nissan Titan XD, and RAM ProMaster City. This year’s finalists do the ‘heavy lifting’ in every day life, while achieving greater levels of environmental performance without sacrificing core capabilities expected from these highly-functional vehicles, said Green Car Journal editor and publisher Ron Cogan. Green Car Journal has yet to announce its 2017 Green Car of the Year award nominees. Earlier this month, journalists from 22 different countries named nominees for a separate award – the 2017 World Car of the Year. One of the categories was nominees for 2017 World Green Car of the Year: Chevrolet Bolt, Chevrolet Malibu, Tesla Model X, Audi Q7 e-tron 3.0 TDI, BMW 740 e iPerformance, Mercedes GLC 350 e, Honda FCV Clarity, Toyota RAV4, Toyota Prius Prime, Hyundai Ioniq, and Kia Niro. 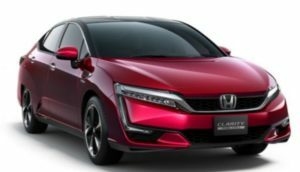 Honda green car sales forecast: Honda CEO Takahiro Hachigo said that by 2030, he wants more than two-thirds of U.S. Honda and Acura volume to come from green cars such as hybrids, plug-in hybrids, fuel cell vehicles, and all-electric vehicles, as reported in Automotive News. That would translate to more than one million electrified vehicles a year sold by American Honda Motor Co., based on its present volume. That would be a steep climb over the next 14 years. American Honda sold only 2,329 hybrid vehicles in the U.S. in the first half of the year, and sales of the Accord plug-in hybrid and Fit EV have been very small this year. Butterfly wings: Fisker, Inc. has released a teaser photo of its all-electric vehicle that will be launched next year. In the image, you can view raising wings on a sports car. Henrik Fisker has released a teaser image of his first new car. Fisker has tweeted the image with the caption: “A Breakthrough: Innovative new butterfly doors in our new Fisker model, for easier ingress/egress.” He also promises that more will be shared soon on the new vehicle. Fuel-cell buses: Toyota has announced plans to begin selling hydrogen fuel-cell buses starting early next year. The company plants to be selling more than 100 of these buses in and near Tokyo in advance of the 2020 Olympic and Paralympic Games. The fuel-cell system is based on what’s used in the Mirai modified to work in a municipal bus. Atieva launching Tesla competitor: Atieva, a Silicon Valley that began making batteries for Chinese buses before hitting financial troubles, is expected to unveil a Tesla competitor in early December, an electric sedan named Atvus. The company started in 2007 and developed batteries and electric drivetrains, plus battery packs for electric buses in China. Since then, investments by Chinese state-owned carmaker BAIC and LeEco seem to have given the company solid financial backing. Atvus will have the same electric drivetrain as the Mercedes-Benz Vito van named Edna shown in videos earlier this summer. Atvus looks a lot like a Tesla Model S, according to Recode. Editor’s Notes: Will California and other states support plug-in hybrids on the ZEV path? 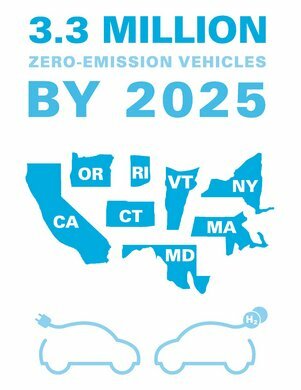 In October 2013, eight states signed an agreement to support bringing 3.3 million zero emission vehicles (ZEV) to their roads by 2025. Led by California, governors from seven other states also signed a memorandum of understanding to do so – Connecticut, Maryland, Massachusetts, New York, Oregon, Rhode Island, and Vermont. At that time, ZEVs were to include battery-electric vehicles, plug-in hybrid-electric vehicles, and hydrogen fuel-cell-electric vehicles – and could be used in passenger cars, trucks, and transit buses. More recently, the California Air Resources Board, the agency implementing the ZEV rules in the state, has been leaning toward battery electric and hydrogen fuel cell vehicles while downplaying plug-in hybrid electric vehicles. California has a goal of cutting its carbon emissions 80% from 1990 levels by 2050. Vehicles would need to be fully electric, and plug-in hybrids wouldn’t cut it, said CARB Chairman Mary Nichols. Here are my thoughts on where this trend could be heading………….. There might be a way to realistically compromise. Ford, General Motors, Honda, and Toyota have filed a complaint with CARB arguing that vehicle owners are more likely to accept and adopt plug-in hybrids to relieve their range anxiety – and these vehicles are more likely to be accepted in the short run. These automakers pointed to a 2014 analysis by the US Department of Energy’s Idaho National Laboratory to make their case. “Researchers crunched data from 21,600 EVs and plug-in hybrids and found that Volt owners were averaging 9,112 e-miles per year, just shy of Leaf owners’ 9,697 e-miles — even though the Volt can go only half as far before running out of battery power,” according to Automotive News. 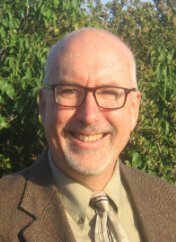 Dan Sperling, a CARB member and director of the Institute of Transportation Studies at the University of California-Davis, tends to agree with automakers on this point. He would rather see two plug-in hybrids on the road than one all-electric vehicle. Taking a more flexible approach is the way to go, according to Sperling. The state is likely to see far more “e-miles in 2030” by supporting plug-in hybrids than would be seen with pure EVs. Next-gen batteries are still two-to-three years away. Automakers are working with major battery suppliers to offer electric vehicles that are more affordable to consumers and can go at least 200 miles on a single charge. It’s expected to be two-to-three years from now for that to be here, but it could take longer – and there are only so many Tesla models that can go 265 or more miles out on the roads. Commercial vehicles need extended range. While some vehicles like drayage trucks at ports might be ideal for battery electric and hydrogen fuel cell, many of them will be on roads for hundreds of miles per day and will need to get there. Trucks being tried out in agribusiness in the Central Valley of California are tipping toward plug-in hybrid systems. Dual fuel and plug-in hybrid could be a good way to go. What if you were to drive a bi-fuel CNG Chevrolet Impala that was also built on the Voltec plug-in hybrid drivetrain? That would offer the driver an opportunity to power the car on natural gas (which emits about 25% less greenhouse gas than a gasoline-engine vehicle), battery power (zero percent emissions) and then have gasoline left over to power the car to take away range anxiety. That might be ideal for fleets that worry about having drivers stuck out on roads. In the next few years, there will be a lot more clean fuels out there, including dimethyl ether (DME), biogas (renewable natural gas), algae biofuel, biodiesel, and renewable diesel. A plug-in hybrid that also runs on a clean fuel would be able to offer extended range and reduced emissions – meeting all the targets. OEMs are leaning toward plug-in hybrids. Battery electrics are doing better than plug-in hybrids in US sales right now, but that tends to be weighted toward the Nissan Leaf, Tesla Model S, and the BMW i3. If you look at the product pipelines for major automakers, most of the models coming out are plug-in hybrid. The challenge here will be picking up their sales volume, which will need incentives and more public education about charging and ownership cost. In the long run, plug-in hybrids/extended range electric vehicles appear likely to equal or surpass battery electric and hydrogen fuel cell vehicle sales numbers. 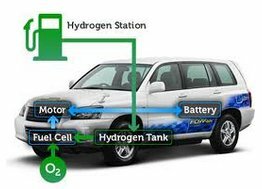 Hydrogen fuel cell vehicles have been the subject of skepticism for years – always waiting to break through but stuck in the planning phase due to excessive production costs for automakers and lack of fueling infrastructure for vehicle owners. In late 2013, automakers (especially Toyota, Honda, and Hyundai) committed to manufacturing and marketing new fuel cell vehicles within the next two years. Now, the fueling infrastructure is getting a boost, and it should benefit from having a prominent automotive executive playing a lead role. FirstElement Fuel Inc. just won a $27.6 million grant from the California Energy Commission that will bring 19 more hydrogen fueling stations to the state. Joel Ewanick, a former Hyundai and General Motors chief marketing executive, serves as CEO at FirstElement Fuel, and says that once these stations are deployed, fuel cell vehicles will be able to drive anywhere in the state without running out of fuel. These 19 locations will be assembled at existing filling stations; FirstElement Fuel is ordering the fueling equipment, which will take months to build and install, Ewanick said. They’re expected to be up and running by the fall of 2015 or sooner. The stations will need to have the fuel delivered at first, but can eventually produce hydrogen on site. Having more stations up and running soon will help Hyundai as it launches its 2015 Tucson Fuel Cell this spring; Honda will roll out its new fuel cell car this year and Toyota said it will introduce its fuel cell model in 2015. Toyota has felt strong enough about the fueling infrastructure to provide FirstElement Fuel with an investment of at least $7.2 million. California announced last week that it is funding $46.6 million in grants for 28 hydrogen stations as part of its commitment to zero emission vehicles. Northeastern states are likely to follow suit with hydrogen fueling, Ewanick said. New York, Connecticut, Massachusetts, Maine, Rhode Island, Vermont, and New Jersey previously adopted California’s clean air standards. Ewanick had served as global marketing chief at GM and was ousted in the summer of 2012 for the handling of a controversial sponsorship deal with English soccer club Manchester United. Ewanick played a key role in marketing the Chevrolet Volt (and accepted the Green Car of the Year Award for the Volt at the LA Auto Show in late 2010); he also served as interim chief of global sales and marketing for Fisker Automotive. Ewanick appears to be fascinated with clean, advanced vehicle technologies and their economic opportunities – as are many other people in the automotive and transportation sectors. The U.S. Department of Energy (DOE) has established research and development projects in the past two years with automakers, fuel station providers, and its research centers. 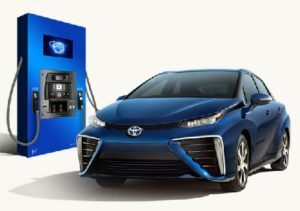 Most recently, DOE launched H2FIRST, a collaboration with Sandia National Laboratories and National Renewable Energy Laboratory; the project will focus on accelerating the design and construction of hydrogen fueling stations. Currently, there are only 11 hydrogen stations in the US (10 in California and one in Columbia, SC). Forty seven are actively in development in California, according to the California Fuel Cell Partnership. Several European Union nations are deploying hydrogen stations (with Germany playing the leading role); Japan and South Korea have been committed to the vehicles and fueling stations longer than other nations, and now have several hydrogen fueling stations set up. Tesla CEO Elon Musk got a lot more media coverage for calling fuel cell technologies “bullsh#t” –except when used in a rocket. Hydrogen fuel cell vehicles don’t come anywhere near the energy density of the lithium-ion battery pack located inside the Tesla Model S, he said. So what’s the latest on hydrogen fuel cell vehicles? The infrastructure is very thin – the US Dept. of Energy says there are only 10 hydrogen stations in the US, most all of it in California. California did approve a funding plan that will be bringing 100 hydrogen stations to the state. Europe is ahead of the US on the infrastructure, especially in Italy, Germany, and Belgium. Hydrogen fuel cell electric vehicles are being included in the zero emission vehicle policies adopted by California, Connecticut, Maryland, Massachusetts, New York, Rhode Island, Oregon, and Vermont. Hyundai wants to beat competitors by bringing the first of its fuel cell models to US dealer showrooms in early 2014. The volume of these cars will be limited, with total worldwide sales to reach about 1,000 over the next three years, the company said. 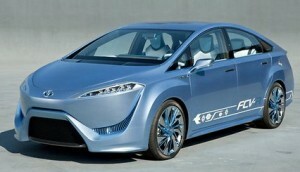 Toyota will be putting a fuel cell vehicle into limited production by 2015. Honda says it will be rolling out a replacement to its FCX Clarity fuel cell car. General Motors, which has been testing out its Chevrolet Equinox fuel cell SUV in Project Driveway, will begin production of its own hydrogen vehicle later in this decade. There’s no word yet on what Mercedes will be doing next with its F-Cell, which like the FCX Clarity, has met with very limited sales so far in California. Fuel cell vehicles are in the midst of ramping up to commercialization, according to Navigant Research. The challenge is reaching sufficient volume to bring down system and plant costs. This is where technology partnerships that we’re starting to see between automakers comes to play. Fuel cell bus deployments are gaining in volume, as are fuel cell scooters and forklifts, which are being carefully monitored by automakers who are rolling out hydrogen fuel cell cars. Home energy stations, such as one that can generate hydrogen from natural gas, are being tested out by Honda. The value of hydrogen fuel cell vehicles are being recognized by automakers and advocacy/support groups for a few reasons: you can fill the tank in just a few minutes; they’re zero emission, clean vehicles; hydrogen can be extracted from a number of natural sources; the price for manufacturing these cars is coming down quite a bit; they’re fun to drive, as people participating in Project Driveway or driving a fuel cell vehicle at a car show will tell you.